Replacement seat, backrest for the John Deere 310 back hoe. This will fit more than the 310 but I do not know which ones for sure so I have added a picture and measurements in the description. Color: Black and CUSTOM made in the USA. Seat cushion measures 18 1/4 inches at its widest point and is 13 1/2 inches deep. Has and comes with 4 bolts on the bottom. The backrest is slightly curved and is 14 1/4 inches long X about 4 1/4 inches tall. The backrest is held on by 2 bolts and those are also supplied. 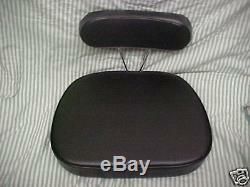 The seat set up does not come with the frame, just the replacemnt padded cushions just as you see in the picture. You will get exactly what you see in the picture including nut and bolts. I also sell Kohler rebuild kits and engine rebuilding tools in my other auctions. The item "Fits, JOHN DEERE 310 back hoe seat, Backhoe Loader, Seats, for John Deere" is in sale since Tuesday, July 23, 2013.